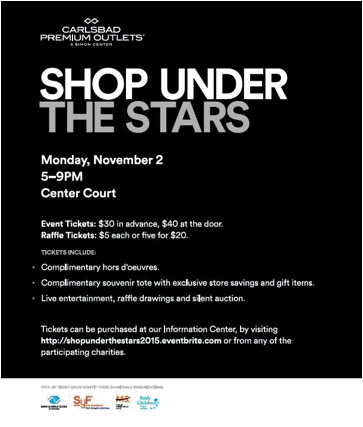 Carlsbad, Calif. (October 28, 2015) – Carlsbad Premium Outlets is set to host its 11th Annual Shop under the Stars charity fundraiser event on Monday, November 2, from 5 p.m. to 9 p.m. in Center Court. 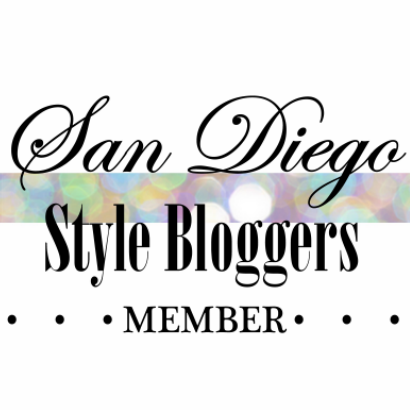 Tickets can be purchased at the Carlsbad Premium Outlets Information Center, by visitinghttp://shopunderthestars2015.eventbrite.com or from any of the participating charities. A limited number of tickets are available. Tickets cost $30 in advance and $40 at the door. Raffle tickets can be purchased for $5 each, or 5 for $20. Guest can also receive one free ticket for every $50 purchase at participating merchants including Godiva, Kipling, Theory, and more. Raffle prizes include perfume sets, Oakley and Solstice merchandise, accessories, shopping sprees to Clarks Bostonian, Ecco, PacSun, and more. Each ticket to the event includes complimentary hors d'oeuvres, a souvenir tote with exclusive store savings and gift items and access to live entertainment, raffle drawings and a silent auction, which includes Coach and Vince handbags and multiple shopping sprees at Barneys New York Warehouse, Elie Tahari, Le Creuset, and more. For more up-to-date news and events, follow Carlsbad Premium Outlets online at twitter.com/CarlsbadPO andfacebook.com/carlsbadpremiumoutlets. Let's Shop for a Good Cause and support our community organizations.